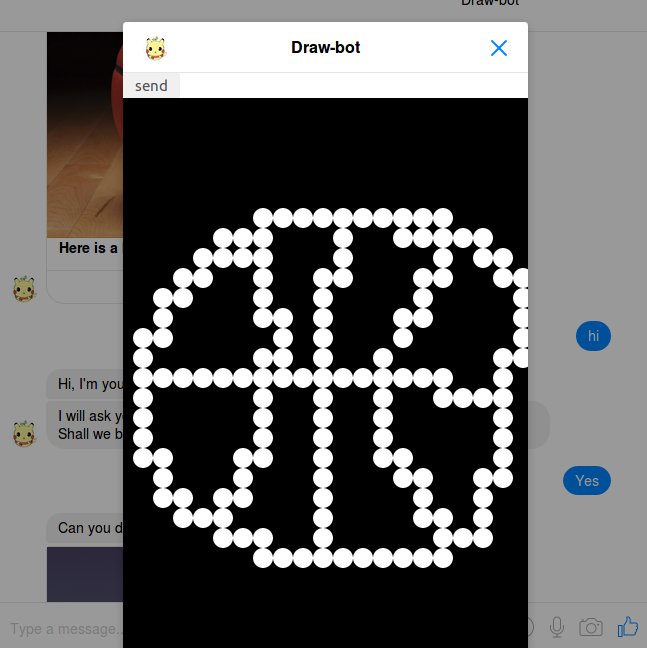 Yet another creative way to use Google Quick Draw dataset in chatbot development with Tensorflow [CNN image classifier tutorial]. Google's quickdraw dataset is a massive crowdsourced dataset.More than 15 million people already have contributed thousands of tiny sketches in each of, around 345 items. That's a lot of data. Applications of this dataset reach further than we think. I can think of these: accessibility / UI, education, games/toys/VR, communication, art, pattern recognition, people/region based clustering for social research. But I believe it wouldn't stop here. What we're going to do is, create a quick demo of a chatbot based game for kids. 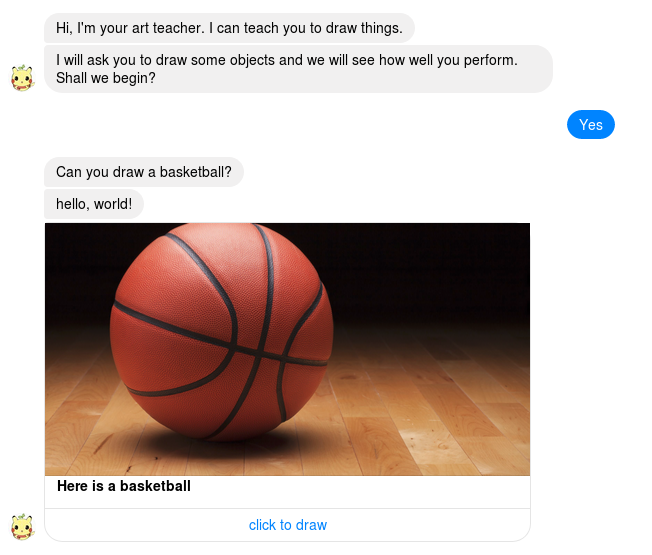 This chatbot will ask a user to draw something and will make use of Machine Learning to identify that item. Because its a game, we need to reward the user. Of cause, the bot will score user's drawing. Google uses an RNN based convolutional neural network to identify the category of image. The RNN part there is useful to learn from the additional data being collected, which is the continuous drawing path - a sequence of strokes of points separated by time. This will highly influence the accuracy values since they are trying to classify objects into any of 345 classes. In this document, they mentioned a good accuracy of 70% with this model. In our experiment, we're only interested in a small number of classes. If we could use an alternative model that's just enough for our requirement of 10 classes, we could train the model on relatively less number of data (10000 examples under each category, which are joined, shuffled and then split into train - 70%, test - 20% and validation - 10% sets) on a basic machine resulting an accuracy of 92%. This will also help us when we host it for prediction purpose as well. The demo that we will build below is hosted on Heroku's free dyno (512 MB RAM with 1x CPU share), which includes the model and bot logic. Google made this data available to the public in four formats. That's really great! It saves a lot of effort from our side. We will be using Numpy bitmap files (.npy) from there. Thus we can skip data cleaning step and jump right into data formatting and splitting. Below is the Python code to setup data for training and then testing. We are going to build a vanilla convolutional neural network in Tensorflow. Here is the overall architecture of that model. Where -1 indicates the batch size of the input to that layer. Next important step is the design of presentation layer. In our case its a chatbot. Microsft Bot framework is a quick bot development tool that we can use. With a very basic dialog flow, we could jump start by asking the user to draw some item. This is kept in bot's memory. The user is presented with an example image to clarify the object that the bot is asking. 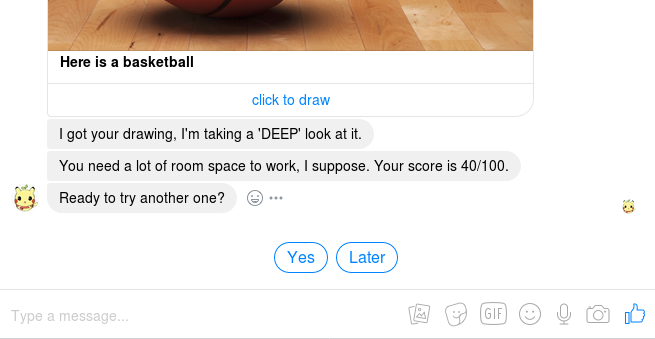 We could make use of Messenger webview to provide a drawing interface to the user. Whenever a user submits a drawing, the machine learning model will be loaded and prediction will be done. The model's prediction will be a list of the probability distribution over those 10 classes that we're interested in. Based on that, we could find the position of our item (that the bot asked the user to draw) and present a score. The entire webapp is written in python with flask library. It's hosted on Heroku's free dyno. yeah! it's that lightweight. That's all. The demo bot is located here. The source code is located here. Thanks. Chatbot Developer at Cedex Technologies LLP | Technology: C, Node JS Hobby: beginner ML & AI + creative coding + Youtuber. What chatbots can do for E-commerce Industry? Be free to contact us for any of your chatbot development queries. As a company specialized in Chatbot development, we can provide you quality services. We will be happy to provide you a free quote. BotArtisanz is a team of specialized Chatbot and Voice apps experts from Cedex Technologies LLP. We design, develop and train high-quality chat bots and voice bots with conversational abilities, context sensitivity, and personality traits. We develop chatbots for all supported messaging channels. We develop voice apps for Amazon Alexa and Google Home. Cedex Technologies LLP, 39/4967 D1, Usnaz Tower, MG Road, Pallimukku, Cochin, Kerala, India 682 016.